I've roasted several chickens on my own before, and they've turned out pretty good. But they aren't that easy to prepare, and I'm just not sure it's worth it -- aside from the disgusting prep work of, um, emptying out the bird, they require careful cooking to prevent drying out. The Harris Teeter near us, however, seems to have no trouble making a juicy, delicious garlic-herb bird that browns up perfectly (for just $4.99 on Sundays!). This makes it pretty hard to resist buying a prepared rotisserie chicken at the grocery store rather than making my own. And that's exactly what I did yesterday when I saw them on sale... but I knew it needed a little something extra. This pesto was perfect! 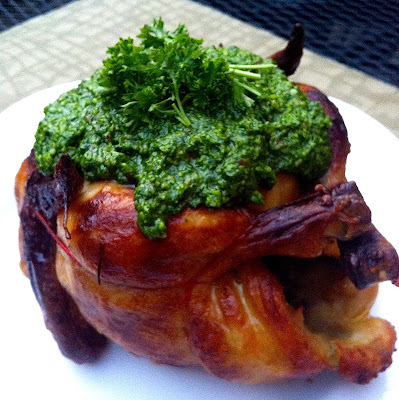 So today, when I got home after a long day at work, I just popped the bird in a 400 degree oven to reheat it for 20 minutes and I prepared this delicious, healthy spinach almond pesto as it cooked. I served the chicken alongside a cabbage and carrot cole slaw tossed with greek yogurt, mustard, apple cider vinegar, dill, S&P and a bit of splenda (no recipe for that - just toss it all together!). It turned out to be a super quick, simple, and healthy meal. Plus, easy cleanup! Ryan was raving about it, and while part of that credit goes to Harris Teeter, I think the flavorful, heart-healthy pesto was the star. -Put all ingredients except oil into food processor and grind. Then, slowly add in olive oil until it's at your desired consistency. 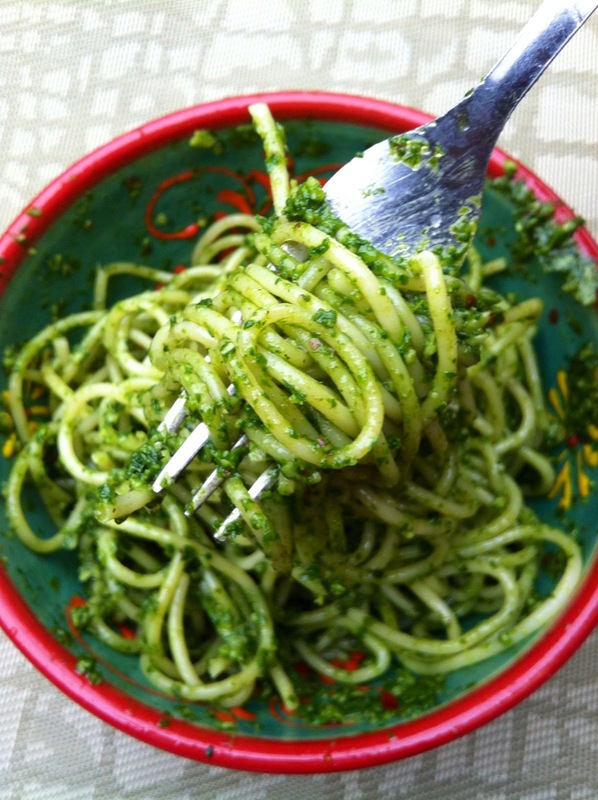 *Update: this pesto is also delicious on pasta!